As we are celebrating the Death Anniversary of Munidasa Cumaratunga it is opportune to take a birds-eye-view of the Empiristic persuits so far not taken into proper comprehension and appreciation, partly due to the specific symbolic impact and the reflective form in most of his literary and critical works. In this doctrine, Empirism is based on observation, experiment, and experience rather than theory. This can be defined as any kind of sense perception. An average person seldom perceives objects properly. Specially Artists endowed with the ability to organize experience systematically belong to this class. It is really the knowledge that we get from experience that most of us make use of the communication with the outside world. In most cases, it is the mental activity which comprehends and shapes any perception. Lord Buddha rightly specified that the characteristic feature of the mind is to perceive objects. Visaya vijanana lakkhanam pana chittam. We have seen how artists arrange and shape perception into pattern forms. Art is a pattern woven differently in the minds of different artists according to the impulses set up by the reaction of their senses. Cumaratungas early experience as a child is vividly and graphically depicted in Piya Samara lay bare the roots of his experience, induced by the environment which stimulated his bodily movement, which paved the way for diverse creative activity and contemplation, Piya Samara gives a glowing account of his emotions, which later were organized as sentiments of the family, familial sentiments which turned out to be sentiments for the school, race, and country. His best experience as a teacher, Principal of Training Colleges, and as an Inspector of schools, Educationist, and Revivalist stood him in good stead to adopt remedial measures for the development of education, during the Colonial rule. "If there is any subject, that suffers at the hands of the teachers and the taught it is the Sinhalese language. Teachers try to teach a subject with which they themselves are not familiar, and the pupils try to master that subject by throughly neglecting it. Both the teachers and the taught attempt to perform a miracle, when they tackle a modern language or the grammar written more than five centuries ago". (preface to Alagiyawannas Subhasita 1937, translation and notes) Cumaratunga rightly observed that the gratest difficulty in Sinhalese Grammar is the mastery of the Sinhalese verb. In keeping with this observation, experience and organising of experience, he made the following comment in Kriya Vivaranaya: A new book, a new order has been set up. Diverse are systems of opinions. Nevertheless I had resort to earlier usages. However, much I try to rid these of errors, it is surprising, if there are no errors. For to err is human. Those who perceive Lapsus  Linguae, please direct my attention", (Preface Elucidation of the verb Vivaranaya published by Pahan paharuva 1935). In Spite of Cumaratungas earnest appeal for corrections (any loop-holes) most of the scholars observed a studied silence. Later the scholars were fully aware of the fact that Cumaratunga had made his observations, and experiments of the language by his consumate mastery of the Classical texts (both prose and verse) and the language of the villager, not polluted by jargon, slang, and cant. Pinto Jayawardena Head of the faculty of Sinhalese, at S. Thomas College, Mt. Lavinia, at that time, frankly admitted the fact that Kriya Vivaranaya has been his constant guide and the final authority in the preparation of Kiriya  Pahaduva made use of to teach the Sinhalese language systematically and methodically. However up to now leading scholars, and teachers, and Educationists, who direct their attention towards research have failed to make a proper study of this research. Make me victorious in the human world. Oh, God Ganesha, grant me wisdom. Are the letters, do not repudiate. Are the poets whom people appreciate. Open up the door of Understanding". In relation to the cult form of Ganesha, Cumaratunga composed The Torch of Ganesha which appeared in Kiyawana Nuwana VIth in June 1939. Gana esuru, is the Sinhalese name for Ganesha (skt) Gana Isha. Gana in Sanskrit means a multitude (of spirits) and Gana Lord. Then it means Lord of the multitude. Ganesha is the son of Ishwara and Parvathi and brother of Skanda. He is endowed with special power to ward off obstacles in all types of work. He is supposed to be the God of wisdom. This god is represented as a dwarf, or as a short person. He is yellow in colour, the colour signifying maturity and ripeness or awareness. With his four hands he holds  1. Discus, 2. Conch shell, 3. a modaka or a sweet ball or some sort of aggala. 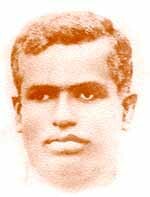 In this poem, Cumaratunga emphasized in a satirrical and humorous manner, that the above dehumanized symbolisation is nothing but a poetical conception prior to this particular representation, he was an animal. Now an elephants head has been projected to the upperportion of the body. Another person got novel idea to replace them by the following in the four hands  1. an Ola manuscript 2. A panhinda or a style 3. An oil-cake, 4. a torch. The cover-illustration in Kiyawana Ruwana  VI suggests this idea fully. In this poetic representation, structure and composition concur, as what is intended and what is presented go well together. Here we notice how Cumaratunga had distorted or twisted the figure of Ganesha to indicate the necessary modifications in order to suggest the new order, the main motive in inserting the torch is to imply light, the light of wisdom and perception so important to children. In the New  Ganesha  projection, Panhinda or style signifies the writing of letters. The oil-cake may imply Rasa Taste, food for thought, in an upto-date manner. For in the past, according to Ganadevi-Halla, salutations have been made in the past in the most traditional manner to the god, in keeping with the prescribed ceremonies. According to the new conception, later Ganesha also came to his proper sense awareness, that his new form, and the practices involved, should be mordenized with the changing times. The poet also stresses the fact that there is an evolutionary process, in which worldlings are subject to change. Whatever the changes he is going to bring about he will never bring down the vitality and strength of the language, and does not pave the way for its pollution. In the poetical freedom, which could be compared to the limitless Samsara (round of births) the sole creator or Brahma is only the poet indeed. Once his inclinations are directed in a particular way, the whole world in turn go that way. The direct reference here is to the overpowering supremacy of the poetic Art. The poet himself is the sole creator. The whole world is that way bound". Cumaratunga was quite aware of the fact that most familiar objects which induce interest are imbued with aesthetic ardour in most of the sensitive children, to divert their attention, and that they are sensitive to specific colourful form, smell, sound and taste as well. Taking all these into account Cumaratunga composed the poem The rose-shrub. (here the thanks are conveyed by the bees to the rose-shrub. This poem gives a vivid and fine discription of the rose-bush, which brings forth beautiful flowers, full of sweet nectar which satiate the bees  the beggars. The rose flower, decorated the very tree which did much to nurtureit. Though it fades away, it has made a valuable contribution to the world, and its life has been fruitful. Having undergone much suffering, it has given sweet nectar willingly and silently, expecting nothing in return. However much jabbering is on the part of the bees. In Mal-bus (speech of flowers), which he composed much earlier, he attributed individual characteristic forms to the rose flower. The children with good character and form (inner and outer) have been compared to beautiful rose flowers, with sweet nectar and fine ordour and harmonic form. In Western countries sanctity and holiness are attached to flowers. Some times the rose is a symbol of Virginity. In this theme the indirect idea which Cumaratunga tried to convey is that a boy or girl, should make a good piece of self-sculpture for their welfare, and for the welfare of the world at large. In this way they can be ornaments to their family and also to the world at large. As pointed out by Hadfield, in Psychology and Morals, the first object of all education, intellectual and moral and religious, is the formation of right sentiments and dispositions ie, the attachment of emotions to the right object, ideas and persons. In our garden, there opened up an ordourless flower. In spite of it, the world finds a splendour. In that vicinity such similar flowers appear. Why does the wasp avoid the Erabadu-Flower? I pluck you out of the cannie. What you are root and all, and all in all. Fie, Fie garden  flower reproachess fell. "Our particular trouble, in this Air-conditioned nightmare which we call civilization, is that we have lost the very notion of cultivating the senses, still butter-fingured and tongue-tied, half-blind and deaf to all nervous vibrations, we stumble through life unaware of its most appealing aspects, lost to its inmost joys and communions. Frustrated and brutalized, we drift between the boredom of peace and the self-inflicted wounds of war, and dismiss as lunatic those few quiet voices that speak of Love and Beauty, and of the renunciations we must accept of power, wealth and pride, if we would have the influence of beauty and love prevail in our lives.